The DOSER powder pump and the other LAMBDA pumps are the only pumps on the market, which allow a simple and precise integration of the amount of liquid, solid or gas that has been delivered by the pump. In processes where the pump is controlled e.g. by a pH-stat during a fermentation or cell culture to keep the pH of the medium constant, it is often important to know when and how much acid or base were added. This data yields important information about the process, its kinetics and time of completion, etc. The pump-flow INTEGRATOR can now be electronically implemented inside the DOSER powder dosing instrument and, therefore, does not require any additional valuable laboratory bench space. The activated INTEGRATOR within the LAMBDA pumps allows new and unusual pump applications (e.g. gradient making, counter flow elution, liquid chromatography, electronic burette, etc.). 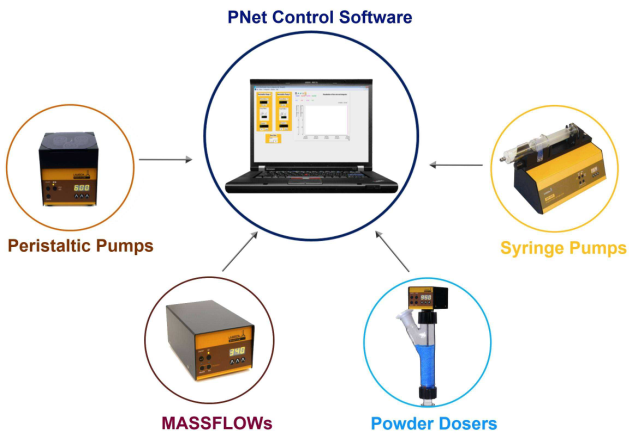 PNet is a PC control software for the remote control of LAMBDA laboratory instruments (peristaltic pumps PRECIFLOW, MULTIFLOW, HIFLOW, MAXIFLOW, syringe pump VIT-FIT, powder dosing instrument DOSER and gas flow controller MASSFLOW). The pumps are connected to the computer through a RS-232 or RS-485 interface. Up to 6 LAMBDA laboratory instruments and 12 INTEGRATORs can be connected and controlled simultaneously. LAMBDA YELLOW SERVICE offers a complete maintenance and support program designed to ensure maximum uptime, ease of operation, lowest total cost of ownership and continued productivity enhancements. DOSERs and HI-DOSERs are in stock and it could get shipped the next day.